AVs are disruptive, and this means that the past is a poor guide to the future. One of the examples of this is public transit and the ways in which driverless taxis and other types of AVs will change transit. Here in Ottawa, Canada, Stage 2 of a new Light Rail Transit (LRT) system is moving ahead with little consideration for how AVs will impact the LRT business case and design. The Ottawa Citizen has published an opinion piece by Barrie Kirk on this. In it, Barrie explains why the City of Ottawa should hit the pause button on Stage 2 for 12 months for an assessment of the significant impact of AVs on the LRT business case and design. The full opinion piece is here. Planning for CAV Canada 2019 is in high gear. Canada's largest CAV conference will feature a wide range of presentations on technology development, testing and the many opportunities and challenges related to deployment. The conference web site is here. At the moment, this is a one-page "hold-the-date" announcement. Additional information will be included by mid-April -- and will be in next month's AV Update. 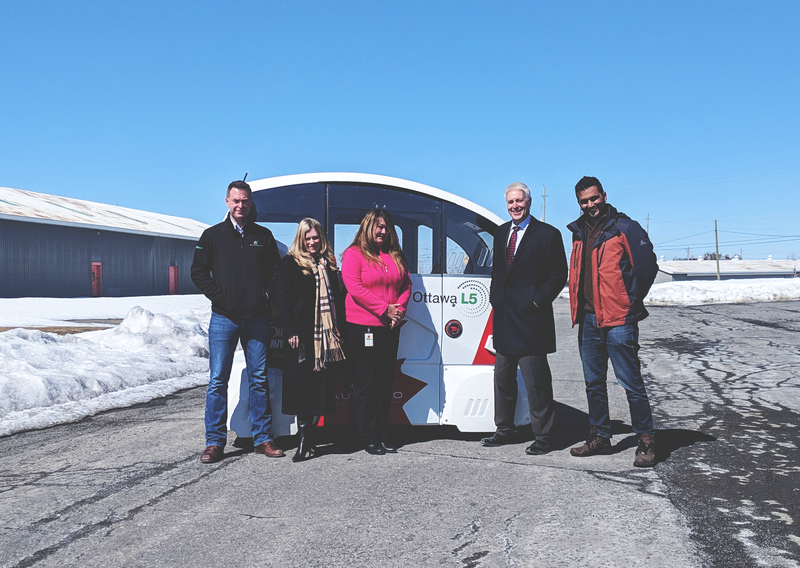 Invest Ottawa, Ottawa's economic development agency, and Aurrigo, the autonomous vehicle division of RDM Group of Coventry, UK, have announced a partnership to test and validate PodZero, a driverless shuttle providing first-mile and last-mile transportation solutions, leveraging Ottawa�s four season climate. This partnership will also include regional pilot projects that leverage the autonomous shuttles over the next few months. The full news release is here. Stacy Janes, who was Chief Security Architect of Irdeto�s connected transport division in Kanata ON, is now Head of Cyber Security at Waymo. This is an excellent move for Stacy; we congratulate him and wish him much success in his new role. We don't often see AVs included as part of an election platform, but here is one excellent example. The Province of Alberta is having an election on April 16, 2019 and the Alberta Party has made AVs one of its election platforms. It proposes to spend $1.6 billion adding 261 Km of new lanes to the QE2 highway between Edmonton and Calgary and introduce AVs on the redesigned highway. It states that AVs can bring $10 billion of economic benefit to Alberta and, coupled with AI, there is the potential to expand Canada�s economy by 1.6% ($26 billion). More information is on the Alberta Party�s website at this link. In the wake of GM�s decision to close its Oshawa ON production plant, the Government of Ontario announced a $40 million funding initiative on February 15, 2019 to give a boost to Ontario�s auto sector, attract new investments, retrain laid-off workers with new skills and provide more funds to the Autonomous Vehicle Innovation Network (AVIN) to develop WinterTech technology and a Talent Development program. The new funding will be spread over 3 years. More information is at this link. The Canadian National Institute for the Blind (CNIB) believes autonomous vehicles will be a boon for blind people and those with vision impairment. Accordingly, it is collaborating with Transport Canada and the University of Toronto to ensure that future AVs will have features needed for people with such disabilities. This is done through an extensive online survey, a literature review, and consulting with vision impairment experts. More information is at this link and CNIB�s site at this link. In a related story, the parent company of Aurrigo Canada in the UK is launching a six-month pilot in April 2019 aimed at people with vision impairment. Using its modified 4-person pods, the pilot will run in Brighton UK in collaboration with Blind Veterans UK. Aurrigo will explore the use of voice activated controls, as well as improved lighting and prominent colours on grab rails and seats. More information is at this link. 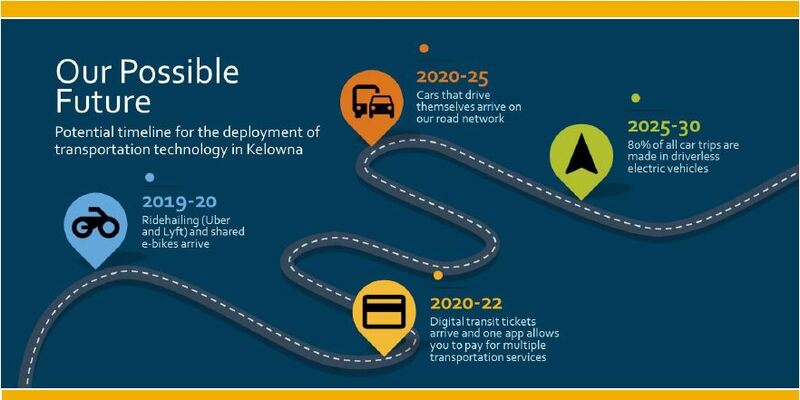 In February 2019, the City of Kelowna BC published a brochure focusing on future transportation technologies. The City believes the future trends in transportation are connected, automated, shared and electric. Furthermore, the City indicates that these technologies will become mainstream between now and 2040. A copy of the brochure can be downloaded at this link. The Economist magazine of February 23, 2019 carried a short article on why retirees and retirement communities are most likely to adopt autonomous vehicles as their primary means of transportation. The reasons for this are threefold. First, the environment of a retirement community is simpler for an AV to navigate compared to busy urban streets. Second, there is strong demand for mobility, and third, retirement communities are a large market. California based startup Voyage is one of the leading companies in this particular area. The article can be viewed at this link. One of the shortcomings of AVs has been their inability to understand hand gestures from other motorists or the police. Waymo claims now that this problem has been solved. A short video released by Waymo on February 20, 2019 shows Waymo's self-driving car approaching a traffic light that is not working. The car comes to a stop before entering the intersection and waits for the officer's signal that it can proceed. More information at this link. The 17 second YouTube video can be viewed at this link. As we mention from time to time in this newsletter, autonomy is not limited to just ground vehicles, it also covers air and marine autonomous vehicles/systems. In an interview with Bloomberg, Boeing�s CEO, Dennis Muilenburg, states that he expects Boeing to test flight prototype air taxis in 2019. He likens the future transportation system to a three-dimensional highway to provide more capacity and relieve traffic congestion. �Pilotless rotorcraft will eventually ferry people and cargo across clogged urban areas�, Muilenburg said. More information and the interview video at this link. Uber�s Advanced Technologies Group (ATG) has developed a web-based open source Autonomous Visualization System (AVS) for autonomous vehicle development across multiple platforms. Uber states that AVS frees developers from having to build custom visualization software for their autonomous vehicles. AVS provides a new standard for describing and visualizing autonomous vehicle perception, motion, and planning data. More information is at this link. In February 2019, the Union of Concerned Scientists published a 38-page report titled �Where Are Self-Driving Cars Taking Us?�. This report examines the future deployment of AVs in the Washington D.C. area through extensive computer modelling to quantify impacts on jobs, mass transit, emissions, traffic congestion, impact on low-income neighbourhoods and communities of colour. For more information or to download the report, click here. BMW and Daimler are pooling their resources and jointly investing US$1 billion for developing all-electric on-demand autonomous mobility. Both companies had been involved in several ride-sharing and AV ventures previously. The two automakers say that the combined programs already have 60 million active customers. They also expect to create up to 1,000 new jobs in the joint venture. More information and statements from the CEOs of Daimler and BMW are at this link. On February 19, 2019, the UK�s Faculty of Advocates composed of the Scottish Law Commission and the Law Commission of England and Wales published a 30-page report on automated vehicles. This report is mainly concerned with legal implications of AVs should something untoward happens. For example, in the traditional software systems, it is possible to examine the software source code to spot flaws or errors in programming. This is not the case with neural networks increasingly incorporated in the current AVs. For more information and to download the report, click here. After its acquisition of Mobileye in 2017 for US $15.3 billion, Intel Corporation has raised its profile in the AV world. It created a new business unit called the Automated Driving Group (ADG), dedicated to the next generation of advanced driver assist systems and autonomous driving solutions. This has led to joint development efforts with Baidu, VW, BMW, Navinfo, China�s SAIC and many others (see this link). Intel estimates the vehicle systems, data and services market opportunity to be up to US $70 billion by 2030. More information is at this link. 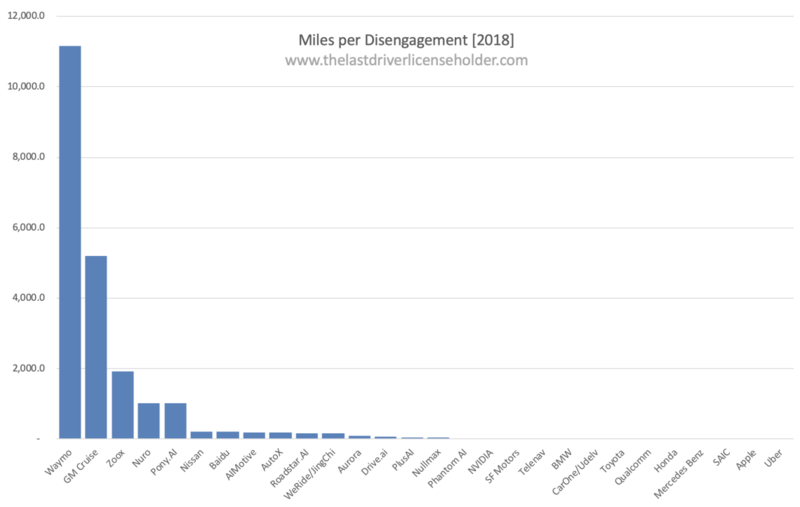 One measure of the reliability of automated technology for ground vehicles is the number of disengagements that the vehicle goes through over a certain number of miles. Disengagement occurs when an AV�s sensing and control systems are uncertain about the course of action it should take when in automated mode. It then disengages and hands the control back to the human driver. The chart below shows the number of disengagements reported by various companies involved in AV research & development. This data is for the State of California only and cover the period November 2017 to December 2018. It is clear that Waymo (on the far left) has a clear lead over the competition. More information at this link. Not surprisingly, FedEx Corporation has been busy developing a delivery robot in line with many other companies reported in this newsletter previously. 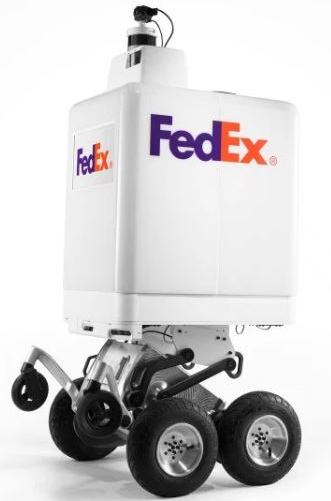 FedEx has tapped the expertise of DEKA Development & Research Corp. whose most famous product was the Segway a few years ago. FedEx will start testing the new delivery robot in its hometown of Memphis and other cities. It is reported that FedEx will be working with Lowe�s, Pizza Hut, Target, Walgreens and Walmart among others in this endeavor. More information is at this link. At this year�s South by Southwest festival in Austin TX, Elaine Chao, the U.S. Secretary of Transportation, announced on March 12th the launch of a new Council at US DoT to support emerging transportation technologies. The Council�s official name is Non-Traditional and Emerging Transportation Technology (NETT) Council. Secretary Chao indicated that the main thrust of this new Council is to coordinate among the 11 operating administrations under USDoT to remove barriers to innovations in transportation technologies such as AVs, connected vehicles, etc. More information is at this link. On March 13, 2109, the UK�s Guardian newspaper published an article titled �The racism of technology - and why driverless cars could be the most dangerous example yet�. Based on research at Georgia Tech, it argued that photos used to train a self-driving car to recognize human figures are predominantly pictures of white people. This could lead to AVs having difficulty in identifying pedestrians of other races. Georgia Tech�s research concluded that AI systems were consistently better at identifying pedestrians with lighter skin tones than darker. Sadly, this issue is not just confined to AVs. Low tech systems such as hand dryers and motion-activated water taps also fail to work properly in the presence of a brown hand but will trigger for a white one. More information is at this link. And finally, Arab News published an article on February 22, 2019 throwing light on another facet of AVs. It argues that owning a car and driving has become part of our DNA in modern times. And this has been reinforced and exploited by countless car commercials. However, no one has bothered to ask the ordinary man or woman in the street if they really want to give up both and opt for a shared automated ride. The article also focuses on the upside of AVs: putting a dent in the 1.2 million fatalities every year due to auto accidents. To put this figure in perspective, it is equivalent to 500 planes each carrying 200 people crashing every month. More information is at this link. June 13, 2019: Third Annual Autonomous Vehicle Summit; San Francisco CA. June 15-18, 2019: Autonomous Vehicle Symposium; Orland FL.